What is a JustPeace Congregation? Some might imagine a congregation in which everyone agrees on every single topic and there’s no tension, conflict, anxiety or arguments over important issues. But, is that a realistic vision? Conflict is inevitable. And, in a JustPeace Congregation, conflict is seen as a gift from God. 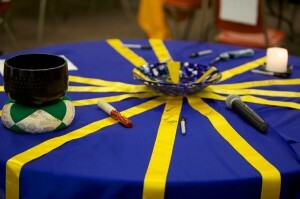 A JustPeace Congregation is a place where conflicts are transformed into positive relationships. The vision of JustPeace is for at least 1% of all United Methodist churches worldwide will self-consciously prepare to be, and declare themselves to be, a JustPeace Congregation in their community – a sign of the desire for relationships that are whole and holy – with God, self, and others, especially with persons encountered daily in homes, neighborhoods, towns of every size and kind. Our vision is that people engaged in relational conflict, or suffering the aftermath of conflict, will call or visit their local United Methodist church because it has gained the reputation of being a place where peace of mind and heart is restored. Our hope is that persons will contact the JustPeace Congregation rather than hiring a lawyer, shouting at a neighbor, hitting a child, reaching for a weapon, or sinking into depression. What if people could come to a church knowing their disputes would be heard in a way that supports both sides? Where the space the community meets at is seen as a safe nonviolent zone; where people can bring difficult conversations in their community and be provided opportunities to engage in constructive ways? We use the word peace to describe our best intentions for life within our families, congregations, communities, the nation and the world. Nevertheless, unease prevails. Nearly always, people turn for help to society’s systems and methods rather that to the church to resolve conflict. There is another, better way than litigation and retribution. Our God, our faith, scriptures, traditions and United Methodist congregations give us another way – a way that leads to reconciliation and life. A JustPeace way. We hope that at least 1% of our congregations become a sign of this other way – God’s way – by preparing, then living as a JustPeace Congregation. How do we initiate conversations with people who are different from us? How do we engage around principles of restorative justice? How do we address others when there has been great harm, violence, or loss? Do we reflect on the U.S. system of incarceration and the impact on families, especially children who are affected by absent parents? If your congregation seeks new ways of resolving conflict and wants to become a JustPeace Congregation, contact us and we’ll be happy to assist. I would like to tell you about a congregation I know that exemplifies a "JustPeace Community"
I would like to talk with JustPeace staff about how I can help foster a culture of justpeace in my congregation or community. Please briefly tell us about the congregation. We will then email you and schedule a time to have a phone conversation so we can learn more.